Artist & art director Jorgen Stovne has a long history with creative work. He’s also got a long list of incredible projects under his belt, yet none stand out quite like Jorgen’s List. The site is a hand-curated list of the best storyboard artists that you’ll find anywhere. Jorgen has worked closely with board artists over his career and his intimate knowledge on how to maintain a career drawing boards, creating art, and helping client visions come to life. In this interview we chat about his inspiration for the website and professional tips for anyone hoping to do storyboarding for a living. What’s your background as an artist and how did you get into creative work? I’ve always loved to draw and express myself in various mediums. In high school I spent an entire year on a claymation movie. They had to chase me out at 5pm every day. I always knew I wanted to be an artist, but at some point I realized making money in that field can be incredible tough. That’s when I started looking at art direction and advertising. Where do you typically find inspiration for your work? My great passion in life is tabletop games with friends. Settlers of Catan, roleplaying games like Pathfinder and Dungeons & Dragons, etc. I can easily lose myself for 6 or more hours in a great game. I’ve come to find that when I allow myself a weekly game session I refuel my creativity and passion for work, even though my brain works just as hard while I’m playing games. I’m also blessed to live in a mountain town with tons of great outdoor hiking space right outside my doorstep. That really helps. How did you first get work as an art director & do you remember what it was like on your first job? I got my first job through a headhunter, Heidi Ehlers, visiting our advertising class at my college. She connected me with Andrew Simon at DDB Canada who brought me on as an intern. Can’t thank the two of them enough for that opportunity. Working there was incredibly inspiring. I always heard horror stories of how competitive advertising agencies could be, but at DDB Canada we worked as a team. All ideas were put up on the walls for people to discuss. And everyone above me only wanted for me to succeed. My biggest blunder was working too much and not taking part of the socializing. It’s easy to get caught up in work when you’re new at a job; don’t forget to get to know the people you’re working with outside of work too. Can you talk a little about your educational background? Where did you study to get your degree & what was that like? I’m originally from Norway, but for college I studied Creative Advertising at Humber College in Toronto and graduated with a Bachelor’s Degree from there. The program was excellent, even though it was their first year. The program coordinators were keen to take feedback from us as we progressed and kept making it better. They produce some really top tier talent there now with former students winning award after award. I believe it’s because they focused on creativity first and design second. I didn’t realize this till later, but most schools tend to focus too much on the technical aspects of a trade. At Humber they equipped us with a smorgasbord of skills(presentation, philosophy, sociology, psychology) that I could apply later to my job. When it comes to college degrees I’m torn. Humber had a great program thanks to teachers that really wanted to make an exceptional program. But some of the smartest people I met in the industry had no formal education. One of my seniors had simply studied the award annuals and reverse-engineered how to make award-winning ads. I do think you can learn anything online these days, but more than anything I believe you need to know how to distinguish useful knowledge from time-wasting sink holes. If you don’t have the opportunity to get an education, look to the best people in the industry and emulate what they do. Don’t just copy them. Analyze what they do and then do it better. Where did the idea for Jorgen’s List come from and when was that created? Is it just for ad agency storyboarding jobs or are there animation studio jobs in there too? I kept a list of artists around for my own reference when I started as an art director. Over time my colleagues began coming to me for recommendations and references and it snowballed from there. It started as only advertising artists, but I’ve added what I call “Director Boards” and other sections too. What are some of the largest problems you’ve faced since launching the website? I never expected the amount of traffic we got. I’m probably backlogged by a year and then some in terms of reviewing applications from artists. It’s a full-time job in itself. That’s why I started a Patreon to help support the running of the site. The donations I receive there go a long way! I still get lots of emails from clients that think they need to go through me, or pay me a fee, for using the artists on the list. In regards to the platform itself, how well does it work to connect artists with jobs? I can only go by what the artists themselves tell me as I don’t have a formalized system for people contacting artists through the site. But from what I’m told it’s really helped boost people’s job frequency. What can a storyboard artist do to get accepted into Jorgen’s List? Shoot me an email with your work and register an application on the list. I’ve also covered this in a blog post that I recommend all applicants read. The best thing you can do is start gathering references from clients as I’ll ask for them to email me if I’m considering adding you to the list. I value client relations just as much as technical skill when considering artists. What do you think defines a “great” storyboard artist? Is it a certain skillset like directing/drawing, or a mix of many skills together? The best storyboard artists help clients visualize what they can’t on their own. You have to be able to listen, take feedback and even add your ideas to the mix. The best storyboard artists don’t just draw what the client wants; they lead the client to what they need. This especially goes for those working with movie directors. By studying cinematography you can help even inexperienced directors improve their storytelling. It also helps being nice. Always be nice. As an art director you must know that connections are huge. Do you have any networking tips for aspiring storyboard artists or aspiring art directors? Beyond the standard answer of ‘go to networking events’, I always say: ‘Be memorable’. Instead try to find something you’re good at that’s needed and become the best pick in that field. I find time and time again that the best people in every industry rarely have time to go to networking events. They’re too busy. So when you DO get to spend 2 minutes with your book in front of the Global Creative Director of some agency, make sure you’re presenting a book of work he’ll remember, instead of a collection of mediocrity in 20 categories. What do you personally look for when hiring a storyboard artist? I can only speak to this as an advertising art director. Advertising clients will take your storyboards and present them to their own client. So I will always look for an artist with a style that won’t take away from my presentation. Some styles can come off as jarring(cartoony tendencies is wrong when presenting an ad for a high end fashion line, for example). I also look for artists that are artists in the classic sense of the word. I see a lot of tracing these days, especially in advertising storyboards, and though it’s a massive time saver it looks off. I don’t mind artists using references but tracing looks stiff. It also makes me doubt the artist’s ability to get the best angle of the scene we’re trying to illustrate. Beyond that, I will always call the friendlier artists first. Good thing that 99% of artists are the nicest people on Earth. 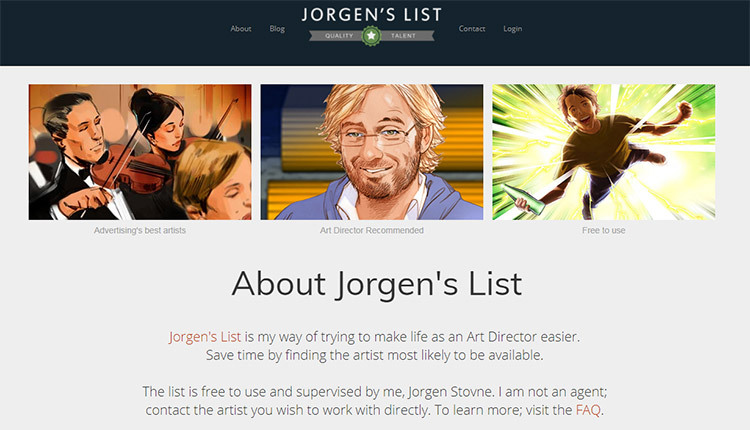 Any cool updates or changes you’re planning to make to Jorgen’s List in the coming future? I have an interface update I’ve been dreaming of for a long time that would help clients sort artists by location and time zones. If people continue to support the list on Patreon I’m sure I can hire the right programmer to make it happen. Any final words of advice you can share for aspiring storyboard artists who want to make it a career? Shoot me an email. I’m always happy to give advice and forward your work if I know of any current artists that are looking for an apprentice. Many thanks to Jorgen for all of his time for this interview! Really inspiring and eye-opening for anyone interested in storyboarding. To learn more you can visit Jorgen’s main website or follow him on Twitter @stovne. Or if you want to learn more about Jorgen’s List there’s lots of great info on this page. 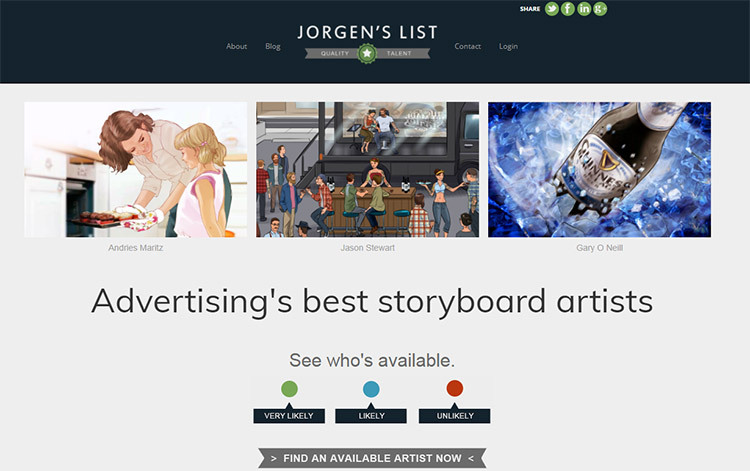 Whether you’re an artist or an agency Jorgen’s List is the best resource to start your search for quality creative talent.